The first round of public hearings of the Commission of Inquiry (CoI) into the Lindo Creek Massacre was Thursday postponed until further notice due to the absence of witnesses. 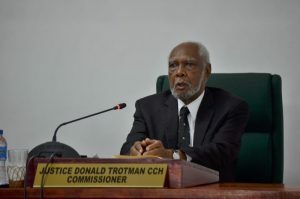 Chairman of the Inquiry retired Justice Donald Trotman today informed journalists and special invitees that the commission was forced to adjourn the hearing because of the lack of witnesses and prerequisites. “I have come to let you know that because of the particular circumstances I have mentioned we will not be having any hearings today and we would have to adjourn these proceedings until such time as we can get these important pre-requisites can be put in place,” the commissioner was quoted as saying by government’s Department of Public Information. According to the Chairman, it is hoped that the situation could be resolved by Monday, February 19. Justice Trotman could not share what those prerequisites are, as they are internal matters. However, regarding the lack of witnesses, Justice Trotman related those family members who were expected to appear before the commission were facing some transportation and other issues. The Presidential Commission of Inquiry has been established to enquire into the circumstances surrounding the killings of Cecil Arokium, Dax Arokium, Horace Drakes, Bonny Harry, Lancelot Lee, Compton Speirs, Nigel Torres and Clifton Berry Wong, on or about the 21 June, 2008 and to report the findings and recommendations to President David Granger. The CoI was also established to investigate and make findings of fact on all matters in relation to the killings of the eight miners in the Upper Demerara-Upper Berbice Region in June 2008. It will also make recommendations on actions to be taken against all persons and/or organisations that are deemed responsible for the deaths of those persons. The commission will be accepting original and follow-up statements from interested parties during its life and will be setting subsequent hearings, to facilitate the attendance of witnesses.